Beneath the surface of modern, bustling Birmingham lies a long history of dark deeds. Let us take you on an alternative walk through the city’s past, retelling stories which may haunt you long after the sun has gone down. Our walks promise tales of plague, public execution, hauntings and murder most foul along the way, and end at a haunted pub. Join us, and find out more about the darker side of Birmingham. 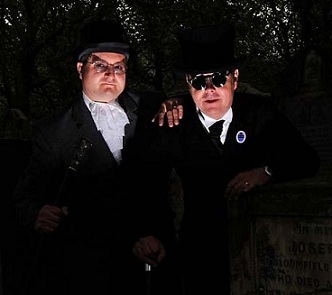 Our Graveyard Ghost Walk visits four of the city’s graveyards, including the chilling catacombs in the famous Jewellery Quarter. It runs on the 1st Friday of the month from January to June, starting at 7:00pm from the front of St Philips Cathedral, Colmore Row and ending in the Jewellery Quarter. There is also a special Halloween tour on the 31st October. Tickets for our regular monthly/quarterly tours can be obtained online from WeGotTickets (no booking fees). To see the start location for these walks on google maps, click here. Ghost walks are also available as private bookings for a staff night out, groups of friends or clubs. Please contact us for details.